Styles describe a way of rendering for geodata and are one of the resources of NGW. 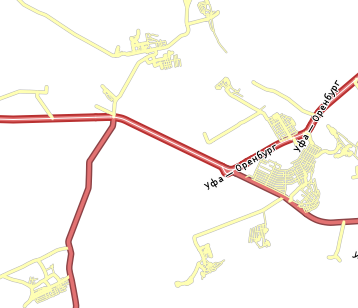 Style is added to a map to display geodata. By now NextGIS Web supports two rendering libraries: “Mapserver” и “QGIS”. You can write Mapserver style yourself as a text or import from QGIS styles, it has few settings. QGIS style you can only download from QGIS styles, it has much more settings. Style is related to a single layer so there is no item “Style” in the main resources list. To create a style you need to open layer properties of the layer you want create style for. In actions pane “Create resource” click “MapServer style” or “QGIS style” (see Pic. 2.53.). In opened window you can import a QML style from QGIS or enter the style manually. After the selection of “QGIS style” create resource dialog will open and will look like Pic. 2.54..
On the “Resource” tab enter the display name. Switch from “Resource” tab to “QGIS style” tab and in the “QML file” field click “Select a file” button or drag a file to this field (see in Pic. 2.55.). QML file to upload should be created in NextGIS QGIS and saved on the PC. After QML file uploaded click “Create”. Then the window of QGIS style will open and will look like Pic. 2.56..
To add a layer with QGIS style to a web-map navigate to home page (see in Pic. 2.4.) and select the web-map in child resources. To edit a web-map click pencil icon near it or click the web-map and in actions pane “Action” select “Update”. In “Update resource” layer select “Layers” tab (see in Pic. 2.57.). Click “Add layer” and in opened window select a layer with QGIS style, then click “OK”. After that click “Save” (see in Pic. 2.58.). In actions pane “Web map” of web-map properties window select “Display”. The map will open, layers tree will be on the left of it. To hide/display a layer place a tick near the layer (see in Pic. 2.59.). To create MapServer style open layer properties of the layer you want create style for (see in Pic. 2.53.). 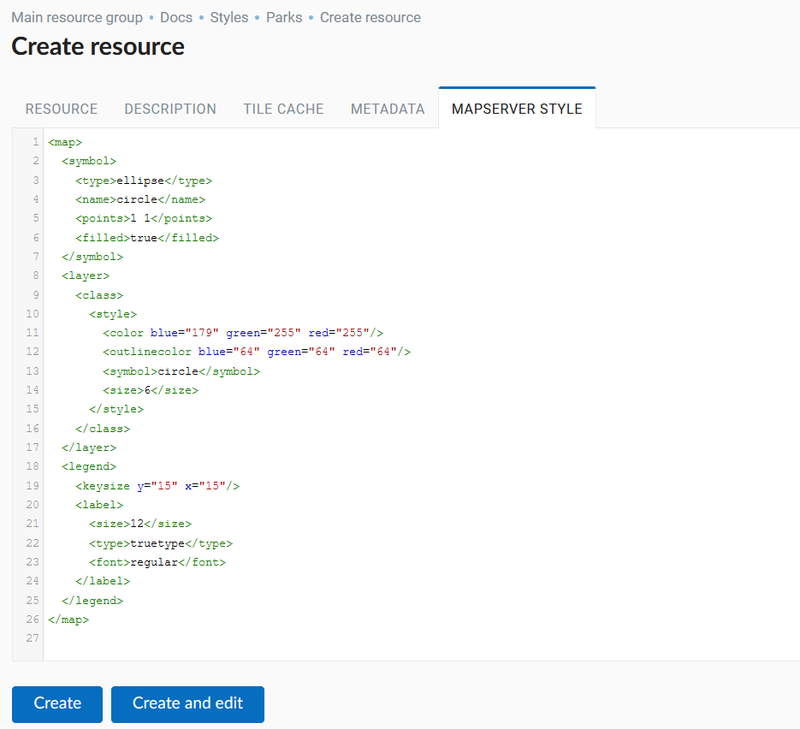 In actions pane “Create resource” click “MapServer style” (see in Pic. 2.54.). Create resource dialog will open and will look like Pic. 2.60..
Switch from “Resource” tab to “MapServer style” tab and click “Import QGIS style” or write a style manually (see in Pic. 2.61.). File to upload should be created in NextGIS QGIS and saved on the PC. After the import click “OK” and then, after “Import QGIS style” window will close, click “Create”. When the process of creation will finish, the window of the file with MapServer style will open. To add a layer with MapServer style to a web-map navigate to home page (see in admin_control_panel`) and select the web-map in child resources. To edit a web-map click pencil icon near it or click the web-map and in actions pane “Action” select “Update”. In “Update resource” layer select “Layers” tab (see in Pic. 2.57.). Click “Add layer” and in opened window select a layer with MapServer style, then click “OK”. After that click “Save” (see in Pic. 2.58.). QML style will be converted to internal system format during import. Currently only basic geometry renderer settings are imported. If a style has a selection by query the empty option should be placed at the end (it is placed first after import from QGIS). If you created a vector layer but MapServer style is absent in Create resource section check if you have installed nextgis_mapserver package. You can check this using “Package versions” (see in Pic. 2.4.) in Control panel (see item 1 in Pic. 2.2. and Pic. 2.3.). You can create or edit a style of the layer using a manual input of a text or a code, or by editing an existing text/code (see details in ngw_mapstyles). To change a style or to create a new one it is recommended you take a code of some existing style and then modify it, so there is no need to start creating a style from scratch. <width>0.5</width> - a width of a line or an outline of the polygon. =* - case insensitive string comparison. <angle> - marker rotation angle. Hatch could also be rotated. <labelitem>a_hsnmbr</labelitem> - attribute name for labelling. LABELCACHE [on|off] - specifies whether labels should be drawn as the features for this layer are drawn, or whether they should be cached and drawn after all layers have been drawn. Default is on. Label overlap removal, auto placement etc… are only available when the label cache is active. <position>ur</position> - label offset direction. ur - ↗ up and right (recommended). 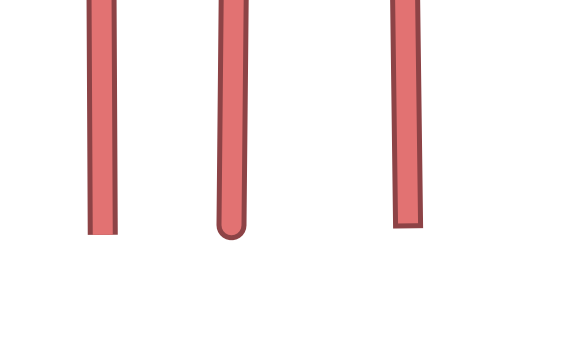 MAXGEOWIDTH - Maximum width, in the map’s geographic units, at which this LAYER is drawn. If MAXSCALEDENOM is also specified then MAXSCALEDENOM will be used instead. 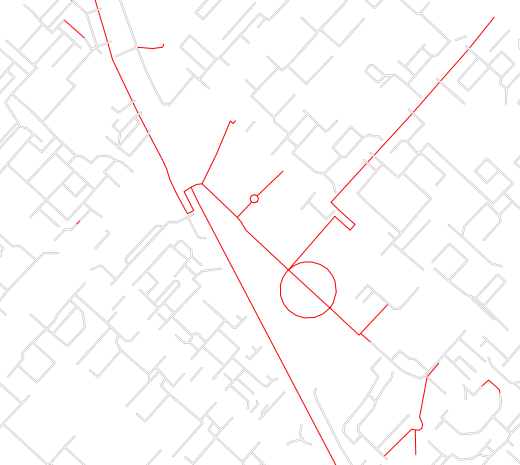 MINGEOWIDTH - Minimum width, in the map’s geographic units, at which this LAYER is drawn. If MINSCALEDENOM is also specified then MINSCALEDENOM will be used instead. OFFSITE - Sets the color index to treat as transparent for raster layers. SIZEUNITS [feet|inches|kilometers|meters|miles|nauticalmiles|pixels] - Sets the unit of CLASS object SIZE values (default is pixels). Useful for simulating buffering. SYMBOLSCALEDENOM [double] - The scale at which symbols and/or text appear full size. This allows for dynamic scaling of objects based on the scale of the map. If not set then this layer will always appear at the same size. Scaling only takes place within the limits of MINSIZE and MAXSIZE as described above. Scale is given as the denominator of the actual scale fraction, for example for a map at a scale of 1:24,000 use 24000. TYPE [chart|circle|line|point|polygon|raster|query] - Specifies how the data should be drawn. Need not be the same as the feature geometry type. For example polygons or polylines may be drawn as a point layer. NextGIS Web styles support for different hatched (see Pic. 2.63. ).